black flamingo brands was born out of a love of selling products that I am passionate about to retailers. Back in the 90s I studied Fashion & Marketing & followed a career in fashion PR for The British Fashion Council & Next until life took me off travelling through Asia where I ended up settling & owning my first retail store called The White Room. In 2003 I returned to the UK to start my family & carved out a successful career in sales. Due to the travel commitments whilst having a young family, & seeing an exciting new opportunity, I changed paths & opened my owned independent boutique on the South coast in Hove. I then returned to a career back in the world of sales in kitchenware, lifestyle & gifts… & now as an agent I sell & seek brands that I love & am truly passionate about. Colour your life happy with Kitsch Kitchen who produce the most colourful home accessories & presents. Original designs by international illustrators/designers (Ingela P. Arrhenius, Fiona Hewitt, Helen Dardik) & beautiful h&made products from Mexico including vases & planters, bamboo door curtains, wire lamps, retro toys & cheerful oilcloth. Kitsch Kitchen is all about adding colour to your life & home. I have always loved products that make me smile & these products do everyday! 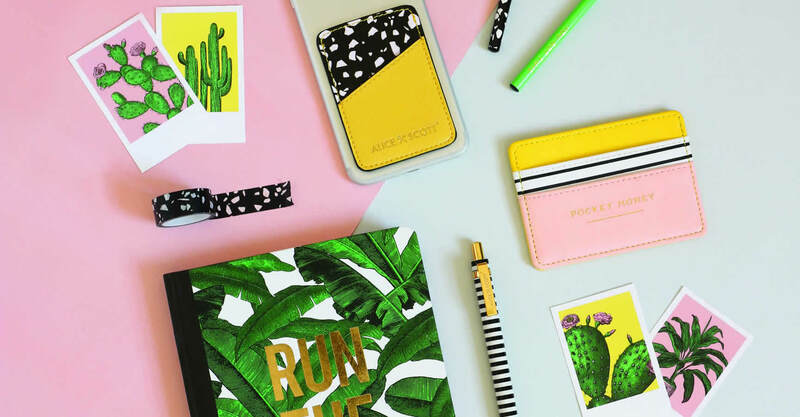 Established over 25 years ago, Portico are independent publishers of quality design-led stationery, gifts, calendars & greeting cards that feature ‘world class’ licensed brands as well as ‘in-house’ originated designs. There’s an amazing team that work out of their Bath office & I am proud to be part of that. They are forward thinking, but always keep the retailers in mind with price & quality. Portico work hard to ensure that the products they supply are of the highest quality & come from proven sustainable sources that are ethically & responsibly managed. True elegance starts from within - Tutti & Co brand begins with a positive attitude, relaxed sensibility and a connection to what grounds you. They are inspired by the natural surroundings of the North East Coastline, travels around the globe & a touch of understated glamour. Kate the founder's true inspiration is strong & authentic women living life to its fullest. Tutti & Co is a thriving design-led business, producing seasonal jewellery, fashion accessories & lifestyle collections. I previously stocked Tutti and Co when I owned my own boutique & am really excited to be representing them. The PyroPet idea came to Thorunn while studying at the Royal College of Art in 2011. After exhibiting the cat candles (called “The Devil’s Pet” at the time) in Milan & at her graduation show, they gained a lot of attention on the internet. She joined forces with Dan Koval & they launched a successful kickstarter campaign to finance their startup reaching 250% of their initial goal. I found PyroPets on Instagram & was instantly drawn to them - the PyroPets & the Secret Message Candles are fun, cool & quirky which ticks all my boxes! Häli Ann Tooms are a botanical studio working with interior plantscapes & decor design. The studio is aiming to exhibit plants & everyday functional items in exciting & unexpected ways. Häli-Ann has won several awards for her work as a landscape architect & she has wide experience with various types of plants & architectural projects over 10 years. Häli Ann’s designs are so simple yet effective that I was instantly drawn to them when I walked past her stand at Maison & Objet. I love finding new innovative & well designed products & am so happy to be representing her products in the UK. Sandy Bay candles are made with their own blend of Natural Wax which has been created and blended in house. The wax is Soy Wax based, but is made up of a number of ingredients including Coconut Wax. It is Palm Oil free, and does not include any animal products other than beeswax. They have created the wax to provide the best possible performance for a Natural Wax, as traditionally they don't create a good fragrance throw when they are burnt. The wax provides a performance which is almost as good as a standard paraffin wax candle, which is unusual. They also use a high dosage of fragrance in the candles, which will fill your room. © black flamingo brands 2019. All rights reserved.